Aiming to make local beaches an enjoyable experience for all, the city of Corpus Christi purchased WaterWheels, designed to make both sand and water accessible to wheelchair-bound beachgoers. 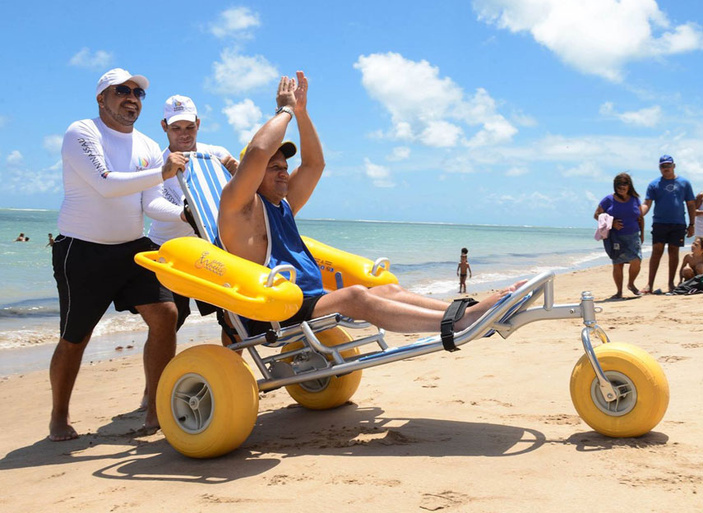 WaterWheels are amphibious wheelchairs designed to travel over beach sand and float in the water. Once purchased, however, the city made no big announcements about the availability of these items and they remained in storage, unused — that is until three Texas A&M University-Corpus Christi students decided to do something about it. Vanessa Nisbet, Brittany Parker and Betty Jo McQueen — three students studying special education at TAMU-CC — led a community advocacy effort to bring awareness to the supply of specialized beach equipment. The students brought the topic to the table at two city meetings: the Watershore and Beach Advisory Committee and the Island Strategic Action Committee. Both committees focus on the use of beaches within the city limits as well as Mustang and Padre islands. Through these committees, the students put the gears in motion to make the equipment more accessible to the public. In May, the Corpus Christi Parks and Recreation Department started a check-out system for the equipment and promoted the free service through local media and online. The three students plan to continue working with the city to promote accessibility. They are currently putting together a pamphlet advertising the equipment. To learn more about the WaterWheels, visit the Parks and Recreation Department page at cctexas.com or call (361) 826-3469.